The problem with making Tuesday your favourite day is that Wednesday doesn’t know what to do with itself… today moreso than any other Wendnesday, because I was waiting around to have a Masterclass at 7pm. A masterclass is a lesson with a visiting teacher and is open to the public, so that everyone can learn from the teacher. Personally – and I know I shouldn’t even be saying this – but more often than not, masterclasses are extremely dull. It depends on the teacher, of course. The only teacher whose classes I really enjoyed is a guy I wrote to yesterday saying, pleasepleaseplease can I take lessons with you next year? My class this evening was pretty good – he asked me if I’d ever had a Spanish lover, for example – but most of the day was given over to not tiring myself out. Guess what that meant! First up, Rod is nearly the same length as Tod. I dug out the body of this raglan and to my delight, it has a near-full ball hanging off it. On the downside, it needs another two inches added to it, so I probably will need another ball to finish the whole thing off. Oh well, nothing I didn’t know. Last night I’d had enough of sleeves and made some progress on my Blue Cotton Vest. It is only the impending yarn shortage that is slowing this project down; I don’t want to accept it. I like it though, it will be a pretty top to wear when I get it finished. By the time it’s done, it will be warm enough to wear! I don’t think swatches ever get as much credit as they should. I knit three swatches today – I frogged the first two because they just weren’t right. With gauge, it’s best to bite the bullet sooner rather than later. This is Jaeger 4-ply merino and I’m swatching for Thermal. A snuggly practical yarn for a snuggly practical top. I’m swatching in blue because that just happens to be the colour I have on hand, but I plan to knit this up in a mahogany colour. Mmmm white lacy camisole underneath with some jeans or a little skirt! I’ve had this Jaeger in the stash for quite a while now. 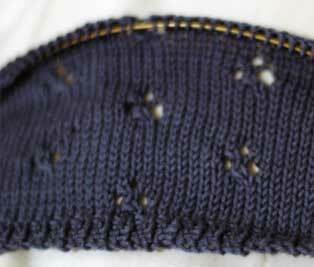 I originally bought it to knit up Rusted Root but I was way off the mark, both in yardage and weight. 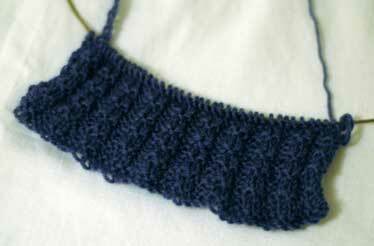 It was too pretty a colour and too useful a weight to return – I love knitting with 4-ply. There’s just enough bang for your buck! I’m going to use this colour for something else. Arisaig perhaps. Oh, while I’m on the subject, isn’t this a fun pattern too? My sewing plans at the weekend were scuppered. My mum got a new sewing machine for Christmas and I wanted to try out the zipper foot. I’ve had a skirt pattern and material sitting in my room for over two years now so I finally got down to it last week and cut the whole thing out. I did a great job. I’m not usually the best with scissors in my hands (scar on schnozz to prove it!). Saturday afternoon rolled around and I got my skirt out to get Mum to show me how to set a zip properly. Disaster! I had cut out two back pieces the same, instead of mirrored, so I was actually missing a piece. I had to leave it. I got my mum to show me how to take up trousers instead. I bought two trousers in Dunnes recently and they’re too long, so today I took a pair of them up to wear to my class tonight. Result! My machine is quite old. I bought it second-hand and it doesn’t have many features. 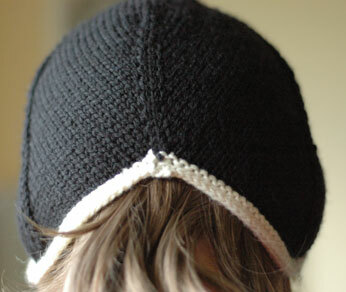 However, it has the essentials – regular straight stitch, zig-zags, it can do a hem stitch which took me about five years to figure out, and today I found out that it has a little reverse stitch button. I’m not even going to try to explain. If you know what it is, great. If you don’t, you’re missing nothing. Did you hear that Debbie Bliss is coming to Yarn in Galway?! She’s coming on February 5th (next Monday) and I would love to go, but I can’t. I half want to go and slobber all over her for being such a Yarn Queen but also half want to go and throw eggs at her (or balls of Rowan Calmer) for not putting schematics in her patterns. We all know I’d just slobber but who knows, I might come over all political and state my case for knitters worldwide driven demented by her magical-mystery-tour patterns. And I have more news! 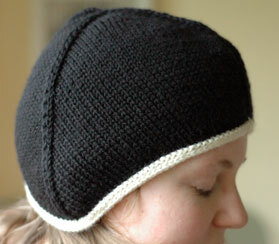 I’m helping with another Beginner’s Class at This is Knit on Sunday week, February 11th. Check out details here if you are interested in coming. Be warned: it is a lot of fun for a Sunday afternoon (and better than putting up with The Match)! Lastly, we all know and love Stephanie Japel of Glampyre, right? 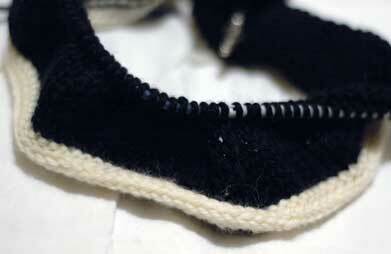 She’s got a book coming out called Fitted Knits and you can have a look at it here. Hello! I think Tuesday is my favourite day of the week. I didn’t work this out logically; I think it’s an instinctive thing, because Mondays are usually horrendous. What makes this even more illogical is the fact that they’re actually not that horrendous. Hmmm, I’m confused now. On to the knitting…. I have christened my sleeves Rod and Tod. Daddy, when will we have hands? I have made my peace with sleeve knitting. It’s really not so bad. 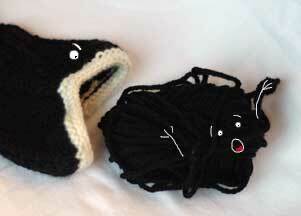 The knitting-hat-for-snake mentality helps alot. If you ever get stuck on Sleeve Island, try it (unless you’re Ophiophobic, in which case, try those tree-trunk scarves I’ve seen knocking about in a few arty-farty magazines)(yes, I looked it up!). Unfortunately there is no peace with the increasing worry that I might run out of wool. When I took up the first sleeve after Christmas to finish it off, I thought to myself, wow, I never knew I could get a 21 inch sleeve out of an 88 metre ball of wool! Today I realised that this is because I used two balls of wool. Two balls of wool for each sleeve plus five balls for the body only leaves one ball left to knit the entire upper section. Increasing worry, did I say? Make that a depressing, Dementor-soul-sucking, tea-made-but-no-milk-left fact of life. No other knitting going on, mostly due to piano stuff. When it occurs, I just have to run with it. I’ve been learning this set of pieces, a set of Beethoven bagatelles, since about October. They’re for an exam in two weeks, but also for a competition in March. Playing pieces is like wearing a costume. Sometimes it’s a perfect fit, the costume becomes you. Sometimes, you can try to make it fit, but it just doesn’t work. Unfortunately in these sort of situations, wearing a snappy beret isn’t as useful as you’d think. I’m lucky because most of the pieces I pick and play do fit me, but sometimes I get unlucky. Then there are times when you know it fits, but you can’t figure out how. I have been playing these Bagatelles for months now and they’ve always been terrible. Terrible. But it’s amazing how being scared to death by a Hannibal Lecter novel in the middle of the night and crying your eyes out over Beethoven’s 7th Symphony on a Monday morning because (because? there’s no because! it was monday!) can make something click. Lol, I don’t know, I just play the piano! In other news, have you seen the new Knitty surprises? My favourite is this one, half because it rules and half because I’ve been reading the designer’s blog for about a year now and I’m well impressed! Want some free sewing patterns to download and sew yourself? Check out the Burda Style site. I’ve always liked Burda patterns because their sizes aren’t nearly as ridiculously small as the other pattern companies’. And if you’re into anything crafty at all, I came across Whipup today and it looks good. Check it out. And if you’re curious, or even just a little relieved that worms are the size they are, go read for yourself. 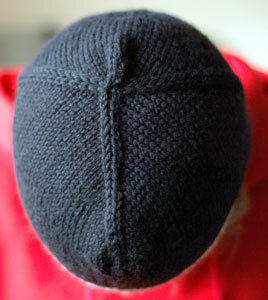 This was a very interesting hat to knit. It turned out fine in the end. If you’re thinking of making this, I don’t recommend watching a highly emotive documentary about the life of Martin Luther King whilst you do so. My, how bitterly I cried into my increasingly deformed hat… and how loud I laughed afterwards when I tried on what only can be described as a Flipper – Clingon crossbreed hat. Phew! 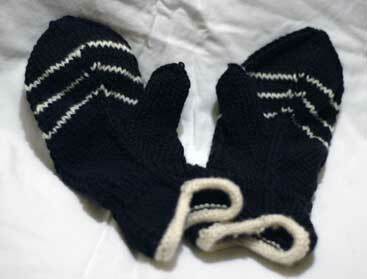 I’m glad now to be finished this set of matching mittens and hat. Incidentally, the hat only took just over one ball of the Debbie Bliss Merino Aran, and I probably could have finished it with the left overs from my mittens. I’ll know for again! 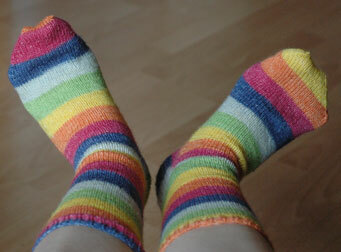 I also finished my Pastille Socks on the train home yesterday afternoon. Every time I look at them I do a little dance. There’s something about seeing -2 C over where you live that really hurries mitten knitting along. ….or rather, should have worked well if I had woven in the unravelled thread enough. I was halfway home from the pharmacy when I noticed this huge rip in the right mitten. Immediate surgery required! Both mittens are recovering nicely and have been left on the radiator to nurse them back to hand-warming health for tomorrow (I have a lesson early tomorrow morning, I’ll need warm hands!). 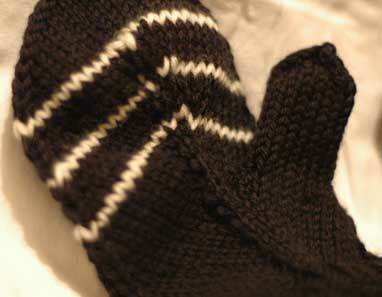 I’m really pleased that I got a whole mitten out of one ball of Merino Aran. 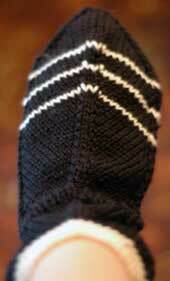 I think I would have just about made the whole mitten without the stripes. Of course, I had to cast on for the Ganomy hat straight away. I’ve googled it, by the way, and I have no idea what Ganomy means. Maybe it’s ‘gnome’ said phonetically or something, because the hat does look pretty gnomey. You know me and hats. I’ll probably have this finished tomorrow. Why can’t sleeves be like this! 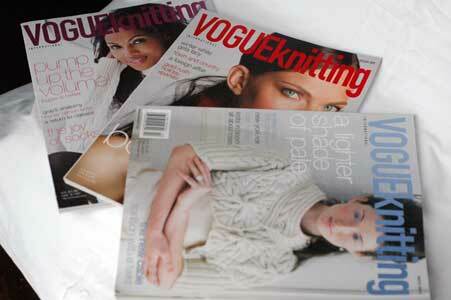 I have a subscription to Vogue Knitting magazine and have found them easy to deal with. When I first ordered my subscription last summer, I managed to order it twice by accident, so I was charged for it twice. I wrote to them and they sorted it out for me, no problem. Since then, I have had no reason to complain. However, when I returned after Christmas, I realised that they hadn’t sent me the Holiday or the Winter issues. I was a bit confused as to whether or not I was entitled to a Holiday issue – Interweave Knits also brought out a Holiday issue, but it was a ‘special’ and was not mailed out to subscribers. So, I emailed Vogue and told them that I hadn’t received my Winter issue, and I didn’t know whether or not I was entitled to a Holiday issue. They replied and said they would look after it. And lo! Three magazines came through my door this morning. Left to right – Fall ’06, Holiday ’06 and Winter ’07. I don’t know why they sent me the Fall issue because I’d already gotten one. But I have it and it’s in pristine condition, so if anyone would like to buy it off me (€7), they’re welcome to it. Let me know. The knit goes on! 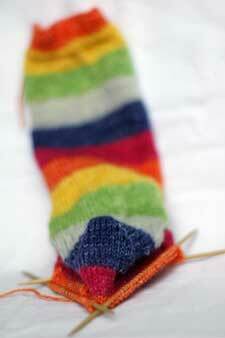 The pastille socks are nearing completion. I finished the leg and turned the heel on the second one yesterday. 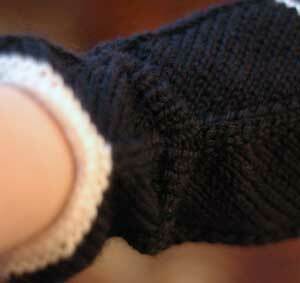 And ‘inspired’ by the Arctic winds outside, I cast on for my first mitred mitten last night. 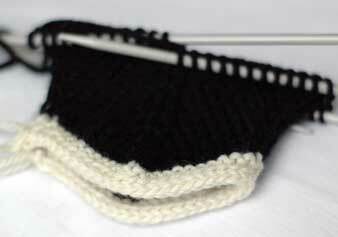 I started off with an i-cord cast-on (not hard) in my contrasting colour, cream. I kept on knitting – it really sped along! The interest of the mitring and the fact that the wool is quite chunky both helped. Once I got past the thumb mark, I added in some cream stripes to highlight the chevron and give it a bit of interest. I actually ripped out the body of the mitten about four times. 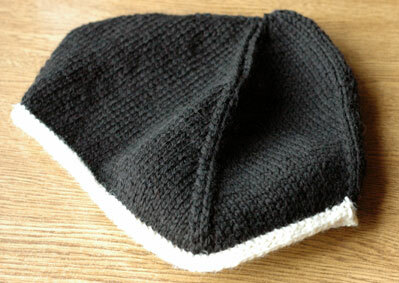 Initially I used 5.5mm needles, and it was turned out too big. I switched to 4.5mm but it was still too roomy around the cuff. So, I ripped back and added in some ribbing around the cuff. Much to my surprise, it actually ballooned out a bit instead of nipping it in. 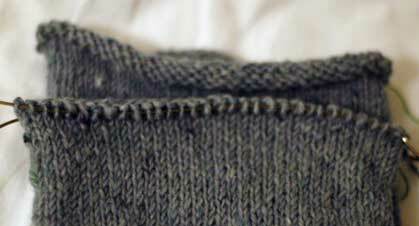 Upon knitting it, I could see that the mitring made quite a stiff fabric and the ribbing was much more elastic. 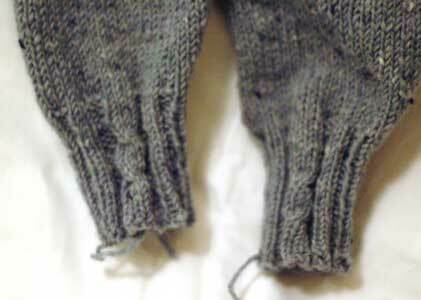 I ripped out the ribbing and re-knitted it using 3.25mm needles. Result! It works perfectly. The pattern I’m using is from EZ’s Knitting Almanac and the yarn is Debbie Bliss Merino Aran. At just 78m per ball, I was afraid that I wouldn’t get one whole mitten out of a ball. 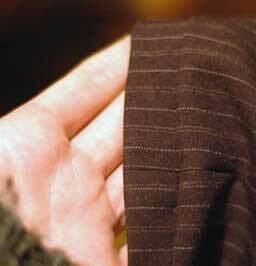 It was this fear that led me to introduce stripes in the first place. But I had nothing to be afraid of! I have more than enough left over to knit the thumb in (anyone notice what was missing? :)). It’s an ill wind that blows no luck though, because the stripes look great.